Two storm sequences are affecting different sections of the fleet and exacting different levels of damage. Third and fourth placed Jérémie Beyou and Paul Meilhat were just six miles apart today. They are training partners from the Pole Finistère Course Au Large school as well as good friends who have now raced as a pair for 22 days of the race. 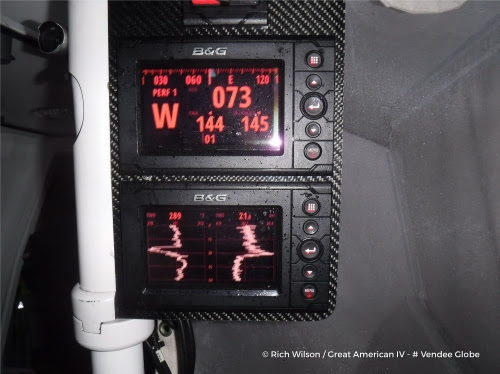 Speaking regularly by VHF they have been able to compare experiences and bolster each other as they deal with the current big blow, 55kt winds and big seas, which has been a very unwelcome surprise. According to both, the weather models did not forecast such strong winds and big seas, and their struggle is likely to continue for at least 36 hours as the low is moving at the same speed as they are. SMA skipper Meilhat told Vendée LIVE today: "We talked a lot after the blow. It doesn't look like we have had any damage, but it was very hairy. We can't get around the low, which is moving along with us. Gybing in 50 knots is not something we want to do. We're going to have to be patient, follow the center and hope the weather will change. The low needs to accelerate..."
Nearly 4000 miles behind, still with some 700 miles to go to Cape Leeuwin, the gang of four have shared similar experiences in a southern ocean low which has also buffeted them with gusts of 50kts and above. 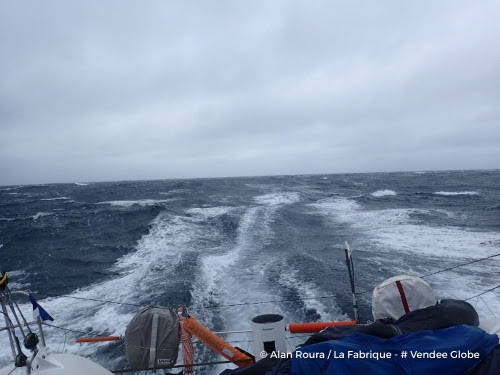 Both Enda O'Coineen (Kilcullen Voyager-Team Ireland) and Alan Roura (La Fabrique) report being knocked flat by waves. Roura has damaged the mainsheet track and hoop of his IMOCA which started life as Bernard Stamm's self-built Superbigou. Sounding shaken the young skipper admitted this morning: "A wave as high as the first layer of spreaders swept in front of the boat and the autopilot was unable to cope, which I fully understand. 45 knots of wind, the keel on the wrong side. Then another breaker on the other side, as the seas were cross, got me back on track in a second. But with the strength of the wind on the mainsail with three reefs in, I couldn't take up the slack on the sheet. The Harken steel eyestrap, which should take 8 tonnes broke. No more mainsail sheet and no more car. For the moment, it's the backstay that is holding up the boom, so I can't do anything on this tack, as there is too much wind and it is too dangerous at the stern. I have fitted a temporary sheet, which will last the day. I'm going to have to go up the mast as soon as possible to repair everything. I have a batten that is broken too." From some 160 miles to the north, O'Coineen, was flattened and is left – once again – questioning his own sanity. His computers are down and he is back to basics on Kilcullen Voyager Team Ireland. "My most crucial issue right now is the computers and my navigation. I am back using paper charts and I have a GPS. I am trying to get my back up system working. I had a crash gybe and went on my side and did a lot of damage, nothing I can't handle. It has been very, very cold and very, very wet. I have a confession to make. I have raided the Christmas chocolates. But this is insanity. A man on his own 500 miles south of Australia, battering 50kt winds. I'd rather be home getting the turkey ready. I feel a bit like a turkey voting for Christmas at the moment." At the front of the fleet Alex Thomson has largely stabilized his losses against leader Armel Le Cléac'h who is now 393 miles ahead of the British skipper with 2000 miles to sail to Cape Horn. Since the start of the race Thomson has been fastest in the fleet over the 24 hour period midday to midday on 13 days. Paul Meilhat has been quickest on six days, Le Cléac'h on four, Thomas Ruyant, Jéremie Béyou and Louis Burton all fastest of the fleet on three days of their race. Pieter Heerema (No Way Back): "Again an eventful night. Whilst asleep got hit by a mighty squall which propelled the boat with full sails well over 24 knots. Not totally under control, but much worse: instruments were completely off the track. Whatever they were indicating was complete nonsense. Purely by luck I had left the pilot on compass mode, which I normally do not do when going to sleep. It saved the day. Otherwise the boat would in that mega squall have done a pirouette and there would -at best- be no rig left, probably much worse! I got the jib furled and the J3 as well and waited for the situation to calm down. As there were no stars, no moon, just blackness it was not pleasant....What there was , was a lot of water! Finally we concluded the pilot is receiving -from time to time and very suddenly- wrong information about the wind. That happens like a gunshot so suddenly and so quick and without any warning, so the pilot just follows the wrong information immediately, sending boat and skipper on a path to hell." Jean Le Cam (Finistère Mer Vent): "I am in a transition phase. Someone behind me is going to be crying and that's Thomas Ruyant. In this low, winds could reach 60-70 knots with ten meter high waves. Best not to go down that road. But once you're in it, you're in it." 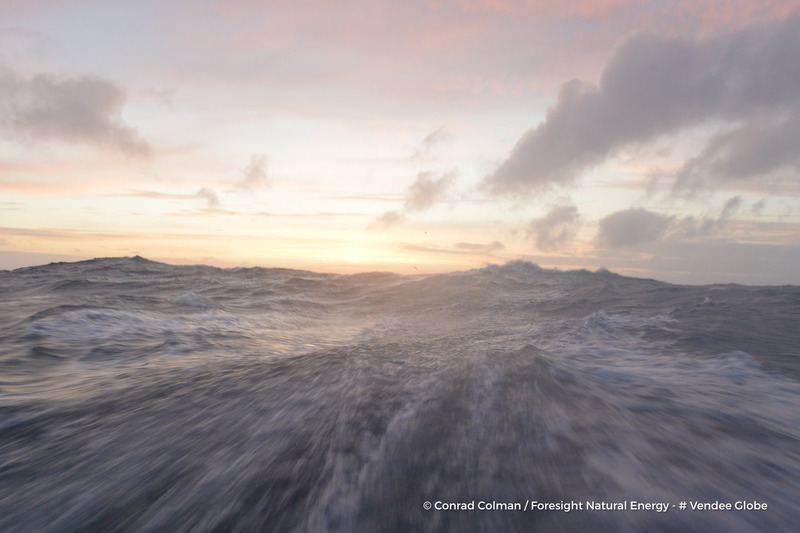 Conrad Colman (Foresight Natural Energy): "The first big depression, one that deserved special mention by the race directors who told us to hang onto our hats, is over and I'm currently running in its train of punchy gusts under a clear sky. After a couple of days of jockeying for position and then a full day of non-stop onslaught, just being able to see the moon feels like salvation! After crossing gybes with Arnaud I decided to run eastwards directly into the path of the depression in the hope that I could use it to break from his grasp. As the dark clouds mounted on the horizon behind me and then rushed over my head I gradually changed down in sails, first the small gennaker was rolled away and packed inside, then I was reaching with the number two jib and one reef, then two in the mainsail then the smallest jib. Finally I was setting speed records for the boat with the smallest sails I had! As the swells grew, falling off them and rushing down their faces in the blackness happened so fast that my stomach flipped like on a roller coaster. The speeds climbed on the counter 26, 27, 28...... 29 in a riot of noise and vibration." Nandor Fa (HUN) Spirit of Hungary: "I was at the computer and I watched the moment when we crossed the Cape and I opened a small bottle of champagne, a very tiny one, and I celebrated with some for the seas, some for the boat, and some I drank. It was a very nice moment. So part of the race is over. Yesterday the wind came and it is better and better, it is cloudy and the wind is getting stronger. 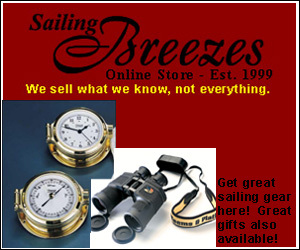 The wind has dropped a little, and in a while we will see 35-38kts of wind again. I am sailing fast and I enjoy it. I am racing. I push the boat. I am not so worried about the place I finish. I want to make a good performance. I don't want to give any places away and feel like I did that without fighting very hard. But if someone is better than me and beats me then that is OK. But if someone beats me just by luck then I would not be happy." 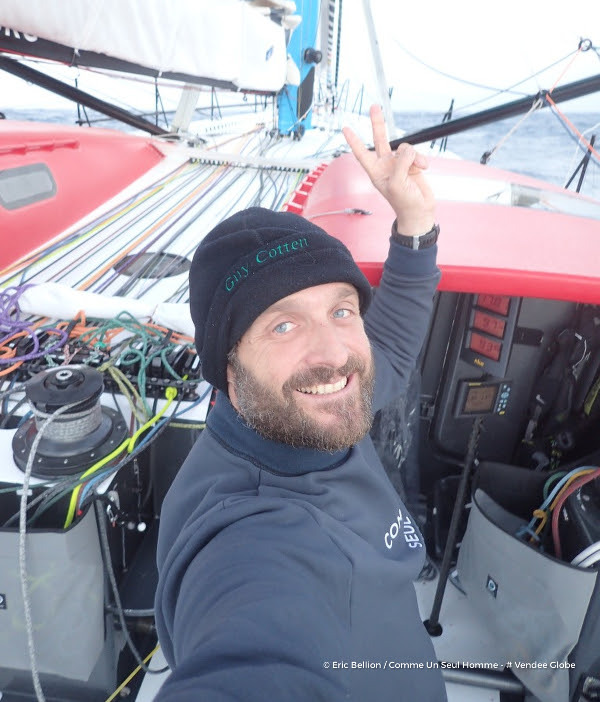 Didac Costa (One Planet One Ocean): The wind is very unstable in terms of intensity and forces me to make sail changes all the time in order to maintain a high average speed and also not to force the boat too much. This, together with the deafening noise of the rigging, the surfing and the slamming, makes it very difficult to rest and so the fatigue is bound to increase. The front will overtake us this evening and, after a short transition, a strong WNW'ly wind will appear. The models are forecasting winds up to 40 knots and quite big waves. They will be the hardest conditions I have faced since leaving Les Sables d'Olonne. The boat is ready and I am going to try to eat and rest and so I will also be ready when the time comes. These days the cold, along with the humidity and the spray, make being on deck especially hard. In the months prior to this Vendée Globe, we discussed the convenience of protecting the cockpit a little more. "Although the strong argument to avoid that was always the lack of budget, we always said that Ellen had done it without protection back in 2000, so afterwards it would not be fair to compare my time with her magnificent one... Ellen passed Cape Leeuwin on the 44th day of the race, so I have seven days to get there... It's an extra motivation…"